Eastman & Smith member James F. Nooney achieved something few people do – fifty years of practicing law. 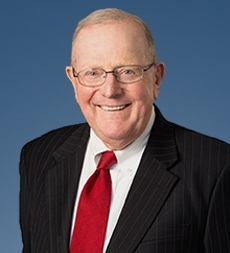 After passing the Ohio bar exam in 1966, Mr. Nooney served four years as a staff judge advocate in the United States Air Force and, during the same period of time, was a part-time law clerk for Kent County, Delaware Superior Court Judge William J. Storey. He joined Eastman & Smith in 1971. Throughout his career Mr. Nooney has represented physicians in all specialties, podiatrists, chiropractors, hospitals and nursing homes in a variety of professional liability and credentialing litigation and administrative proceedings. He has successfully defended numerous medical malpractice claims against cardiologists, emergency physicians, neurologists, cardiothoracic surgeons, endocrinologists and vascular surgeons, among others. He served as president of the Toledo Bar Association and has been selected by his peers as one of The Best Lawyers in America®. An avid tennis player, Mr. Nooney will reach another achievement, fifty years of marriage. He and his wife Carole raised three children in Perrysburg and have several grandchildren. The couple continues to reside in this Northwest Ohio town. Eastman & Smith congratulates Mr. Nooney on his achievement and thanks him for many years of service.